There are more than 700 species of Eucalyptus. Some species of Eucalyptus have grabbed the attention of global development researchers and environmentalists. Apart from being colorful, this flower releases a smell that captivates the senses of all. Its aroma is like splash of freshness that re-energize the mind, body, and soul. 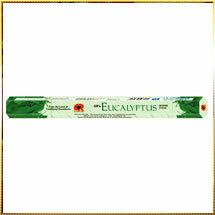 To capture its aroma in form which you can enjoy all round the year, we have come up with a range of Eucalyptus Incense Sticks. These incense sticks release aroma that captivates all senses. It is widely demanded for religious purposes and in aromatherapy centers, spas, and therapeutic institutions.